One egg "your way" with a toasted buttered bagel. Three egg white omelet stuffed with spinach, mushrooms, onions and chicken (unprocessed all white meat) served with ripe tomato slices. A ½ of a Frank Special with one egg your way, one piece of fluffy "challah" French toast, plus toasted buttered bagel of your choice. Includes your choice of bagel with either fresh sliced salty belly lox or Nova (non-salty salmon). Includes romaine, tomatoes, sweet Bermuda onions, capers and cream cheese. All toppings served on side. Dressing Choices: House Made Seedy Honey Mustard, Exquisite Paris Dressing, Creamy Buttermilk Ranch, Fat-Free Raspberry Vinaigrette, Creamy Caesar, House Made Balsamic Vinaigrette, Apple Cider Vinaigrette. Includes a side of garlic bagel chips and bruschetta cream cheese schmear. All produce is locally grown! Hearty house salad of mixed field greens and spinach topped with either Albacore tuna, fresh boiled egg salad, sliced oven roasted turkey, all white meat grilled chicken or honey walnut chicken salad. Baby Spinach tossed with cran-raisins, sliced apples, sweet Bermuda onions and feta cheese. Unprocessed all-white meat, mixed field greens and spinach topped with Thick cut apple wood bacon, chopped egg, cheddar cheese, cucumbers, tomatoes, Bermuda onions. Great when served with our house made Paris dressing. Topped with our homemade garlicky challah croutons and finished with shaved Parmesan cheese. Sweet crispy coleslaw, red bliss potato salad, mini knish, bagel chips, Lay’s potato chips or home-fried potatoes. *All royal sandwiches are accompanied by your choice of sweet crisp coleslaw, red bliss potato salad, home fried potatoes, mini knish, bagel chips or Lay’s potato chips. Choice of corned beef, turkey, pastrami or sliced ribeye roast beef, served with provolone, caramelized onions and dusseldörf mustard on a delicious homemade baked potato knish. Au Jus on our homemade sub topped with juicy sliced ribeye, caramelized onions, düsseldorf brown mustard and provolone cheese, and accompanied by au jus. 8 inch sub piled high, sliced ribeye and a plethora of peppers and caramelized onions, topped with provolone cheese. Juicy steamed pastrami or corned beef stacked with melted Swiss cheese, grilled onions, düsseldorf mustard, 1000 island dressing and pure horse radish on grilled rye bread. on your choice bagel topped with ripe ruby tomatoes and melted swiss cheese on your choice bagel. Cuban bread topped with turkey ham and juicy sliced ribeye, Swiss cheese, pickles and Düsseldorf mustard, pressed to perfection. Made with 98% fat-free, oven-roasted turkey topped on our toasted spouted wheat berry bread with sauerkraut, brown mustard and light amount of Swiss. Choice of meat on grilled rye bread, stacked with provolone and Swiss cheese, 1000 island dressing, mustard and sauerkraut. 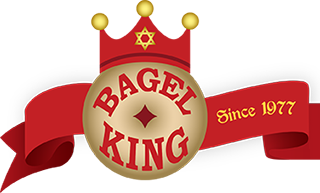 *A Bagel King Specialty: "Knish"
A knish is a thin amount of dough stuffed with mashed potatoes and seasoning, baked not fried "great with a schmear or Düsseldorf mustard"